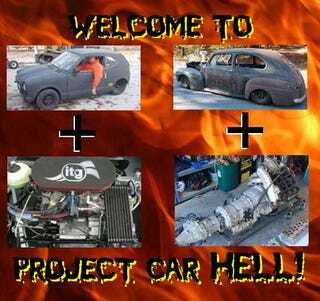 PCH, Engine Swap Edition: Hayabusa-ized Honda 600 or Duramaxed '47 Ford? We had a trio of Honda 600s in an earlier Project Car Hell, and the subject of this insane Hayabusa-powered 600 came up in the comments. Since then, the idea of stuffing one of Suzuki's loony engines in a 600 has hovered around us, a miasma we can only dispel by showing how we might go about doing the same sort of thing on a smaller budget. So! The recipe could go as follows: Take one tube-framed 1971 Honda 600 (go here if the ad disappears) and subtract the Chevette engine that comes with it. Next, add one this 2001 Hayabusa engine (go here if the ad disappears), which is already set up for installation in a four-wheeled vehicle. Stir well, seasoning liberally with blood, sweat, and cubic dollars. The 600 is already set up for rear-wheel drive (which is fine) but that doesn't mean you can't convert it back to front-drive and end up with the scariest torque-steering beast to ever drive on a public road... or get a second Hayabusa engine and make it a twin-engined, all-wheel-drive, totally uncontrollable deathtrap! (go here if the ad disappears). Yes, naysayers, we know the engine needs rebuilding, but you get the engine ECU, an Allison transmission, and a transfer case- and the seller takes credit cards! Hmmm... Veggie-oil Duramax Monster '47 Ford, anyone? Thanks (and a half-credit towards a PCH Tipster T-shirt) to Mad_Science for the tip on the Duramax!